Beaba Set 6 training spoons and 4 training ..
Nuby Garden Fresh - Fresh Food Baby Press w..
Tommee Tippee Closer to Nature Steamer Blen.. In additional to the steam cooks, blends, defrosts and reheats, Babycook® Original Plus is even more considerate to mum's for her newborn baby with the bottle warmer and sterilizer functions! 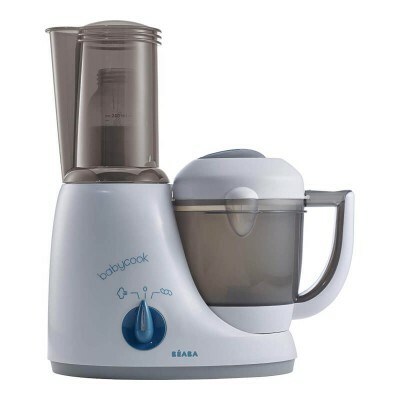 PRODUCT MAINTENANCE - Wash accessories by hand or dish-washer / Descaling: half water / half white vinegar in the tank or babycook® descaler. - Patented steamer: preserves vitamins and minerals, separates steaming liquid from food for adjusting the consistency of baby’s meal. * Cloche compatible with all feeding bottles less than 73mm in diameter, except bottles with a removable valve at the bottom of the bottle.